One of my biggest insecurities has always been looking young for my age. I know this is laughable to most adults, but growing up, looking significantly younger than my age wasn’t exactly a badge of honor. It’s often forced me to have to work a lot harder to be taken seriously. But as I near thirty, I'm beginning to take pride in my baby face. Now, when I get carded for a glass of wine or asked what grade I'm in, (yes, seriously!) it finally feels like a compliment! I would like to think that I can at least partially attribute this ongoing misconception to my skincare regimen. Many years ago, I remember my grandma teaching me that to avoid looking wrinkly, you need to wash your face every night and apply moisturizer to your face and neck. So since I was in junior high, I've religiously cleansed and moisturized. Over the past few years, I've become passionate about replacing my most-used products with natural alternatives. Since I get asked about this all the time, I wanted to share my absolute favorite natural skincare and cosmetics line, 100% Pure. I first encountered this brand when I bought a bottle of their heavenly-smelling coconut body cream from a small shop in Kauai about a decade ago. I was instantly obsessed! The whole line is totally natural, cruelty-free, and often organic, vegan/vegetarian, and gluten-free. 1. Coffee Bean Caffeine Eye Cream: So this was the first skincare product I ever tried in my life where I saw a visible difference after applying it just once. Since I'm naturally pale, the dark circles under my eyes have always been pretty noticeable. After applying this eye cream every morning, I no longer even buy concealer. A little bit goes a long way- one tube lasts me over a year! 2. Blood Orange Cleansing Balm: This is a new one for me, but I'm totally hooked! After my favorite cleanser was discontinued, I was reluctant to try this cleansing balm because it's unlike anything I've ever used. You massage just a little bit of the organic olive oil and coconut-based balm onto your face, wipe it (and your makeup) away with a warm towel, and then rinse. After I wash my face with this, my face feels so clean and moisturized. 3. Mattifying Primer: This is another new addition to my routine, thanks to receiving a free bottle with a recent order. Since I don't wear a lot of makeup, I usually don't use a primer, but I absolutely love the feel of this one on my skin. (It's infused with skin-plumping seaweed collagen, rather than silicone.) I apply it before my BB cream, but even when worn on its own, I notice my skin feels softer and looks smoother. 4. Long Last Liquid Eye Liner: I know a lot of people hate applying it, but I've always been a liquid eyeliner girl. I wear just a quick swipe of it on my upper lids plus mascara. This one stays put better than most brands I've tried and is pigmented with black tea leaves. 5. BB Cream: I've worn this BB Cream foundation with SPF 15 for a couple years now. It has more of a dewy finish, but it's just the right amount of coverage for me. If you're used to wearing more makeup and like that matte finish, just add powder. The shade that I wear is 10 Luminous, and I've found that it blends in naturally whether I'm at my palest or tannest. 6. Fruit Pigmented Eye Brow Powder Gel: This is the one step in my whole makeup routine I won't leave the house without. As long as I have my eyebrows filled in, I feel polished enough to face the day! I use the "Brunette" shade and apply it with an angled brow brush. I love it even more now that I've added primer to my routine. 7. Fruit Pigmented Ultra Lengthening Mascara: If you haven't tried a natural mascara before, you're probably a little skeptical. But trust me, I've used Chanel, Diorshow and Maybelline, and I honestly would say that this 100% Pure mascara is totally comparable. It separates and lengthens lashes while conditioning them. I wear the Black Tea shade and I love knowing that if it does flake and get in my eyes, it's naturally pigmented with black tea, berries, and cocoa, rather than harsh dyes and chemicals. 8. Fruit Pigmented Blush: Typically, I don't wear blush, but this is another product I received for free and now I'm tempted to put it on everyday. 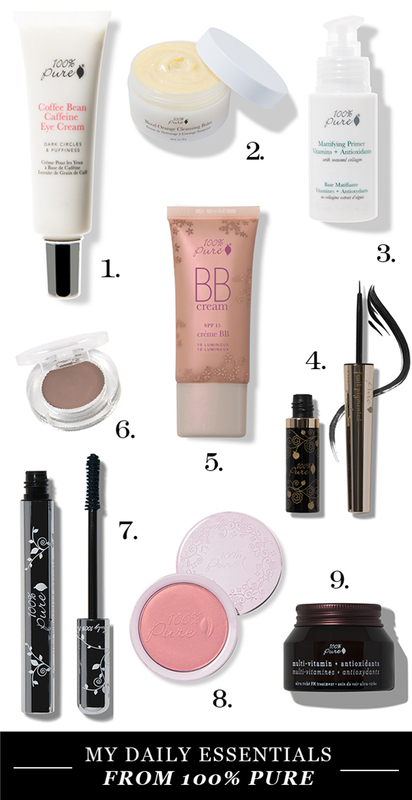 I use the shade "Chiffon," which is a warm but neutral pink that goes with most everything. 9. Multi-Vitamin + Antioxidants Ultra Rich PM Treatment: This replaced my previous favorite night cream which was discontinued. It's pricy by my standards, but so worth it! I try to use just a little but am so tempted to slather it all over my face and neck every night. It is gloriously rich and creamy and smells like chocolate oranges! When I wake up in the morning after using this night cream, my skin feels totally revitalized. Other 100% Pure products I've tried and would recommend include my beloved Coconut Nourishing Body Cream, Bright Eyes Masks, Brightening Serum, Pink Grapefruit Shower Gel, French Lavender Hand Buttercream, and Fruit Pigmented 2nd Skin Concealer. As a reminder, there are affiliate links included in this post, which means that I may profit when you purchase these products. I share this for the sake of transparency, but please know that the products I feature are totally uninfluenced by commissions. These are products that I absolutely love and use daily.